Geneva, February 11, 2019 - STMicroelectronics, (NYSE: STM), a global semiconductor leader serving customers across the spectrum of electronics applications, has integrated machine-learning technology into its advanced inertial sensors to improve activity-tracking performance and battery life in mobiles and wearables. 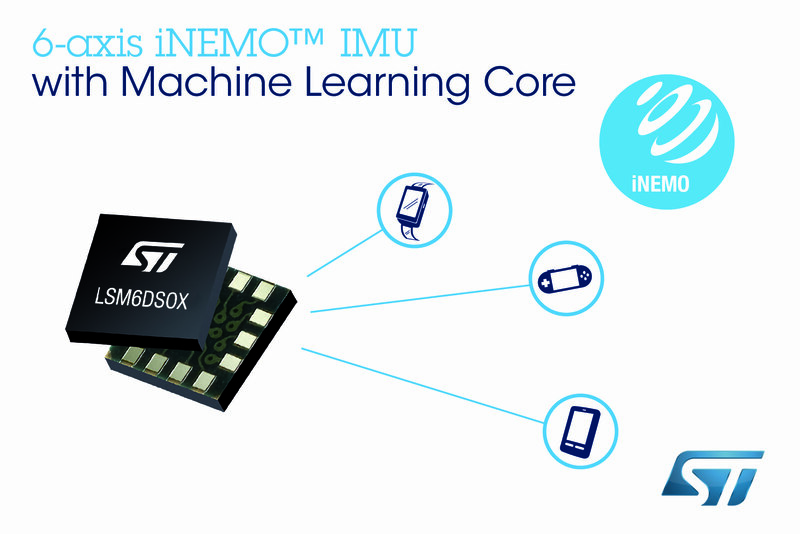 The LSM6DSOX iNEMO(TM) sensor contains a machine-learning core to classify motion data based on known patterns. Relieving this first stage of activity tracking from the main processor saves energy and accelerates motion-based apps such as fitness logging, wellness monitoring, personal navigation, and fall detection. "Machine learning is already used for fast and efficient pattern recognition in social media, financial modelling, or autonomous driving," said Andrea Onetti, Analog, MEMS and Sensors Group Vice President, STMicroelectronics. "The LSM6DSOX motion sensor integrates machine-learning capabilities to enhance activity tracking in smartphones and wearables." Devices equipped with ST's LSM6DSOX can deliver a convenient and responsive "always-on" user experience without trading battery runtime. The sensor also has more internal memory than conventional sensors, and a state-of-the-art high-speed I3C digital interface, allowing longer periods between interactions with the main controller and shorter connection times for extra energy savings. The sensor is easy to integrate with popular mobile platforms such as Android and iOS, simplifying use in smart devices for consumer, medical, and industrial markets. The LSM6DSOX is in full production and available now, priced from $2.50 for orders of 1000 pieces. The LSM6DSOX contains a 3D MEMS accelerometer and 3D MEMS gyroscope, and tracks complex movements using the machine-learning core at low typical current consumption of just 0.55mA to minimize load on the battery. The machine-learning core works in conjunction with the sensor's integrated finite-state machine logic to handle motion pattern recognition or vibration detection. Customers creating activity-tracking products with the LSM6DSOX can train the core for decision-tree based classification using Weka, an open-source PC-based application, to generate settings and limits from sample data such as acceleration, speed, and magnetic angle that characterize the types of movements to be detected. Support for free-fall, wakeup, 6D/4D orientation, click and double-click interrupts allows a wide variety of applications such as user-interface management and laptop protection in addition to activity tracking. Auxiliary outputs and configuration options also simplify use in optical image stabilization (OIS).